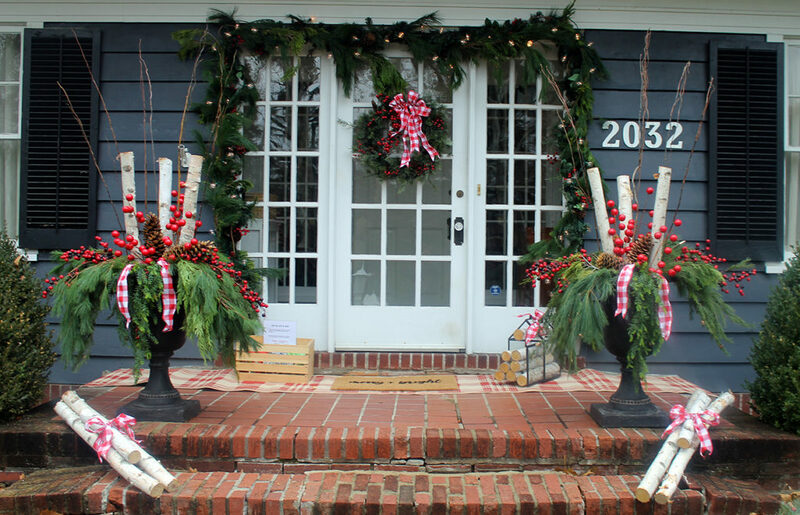 I am so excited to share my front door decorations with you today! Maybe because so many of you were giving me positive feedback when I shared snippets of it over on INSTAGRAM. I must tell you that I’ve been planning some of it since last December. 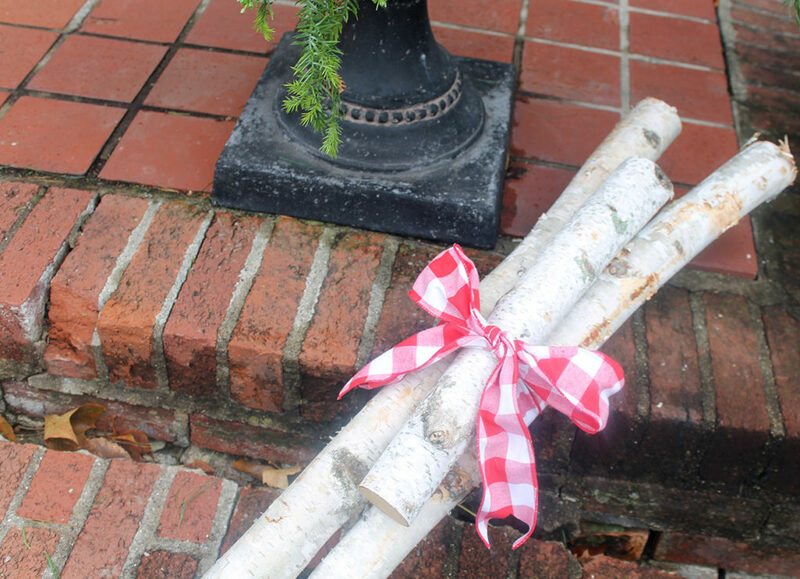 When Claire and I were in Chicago for her Mother Daughter Birthday trip a year ago, I noticed some beautiful decorations using birch poles and logs. 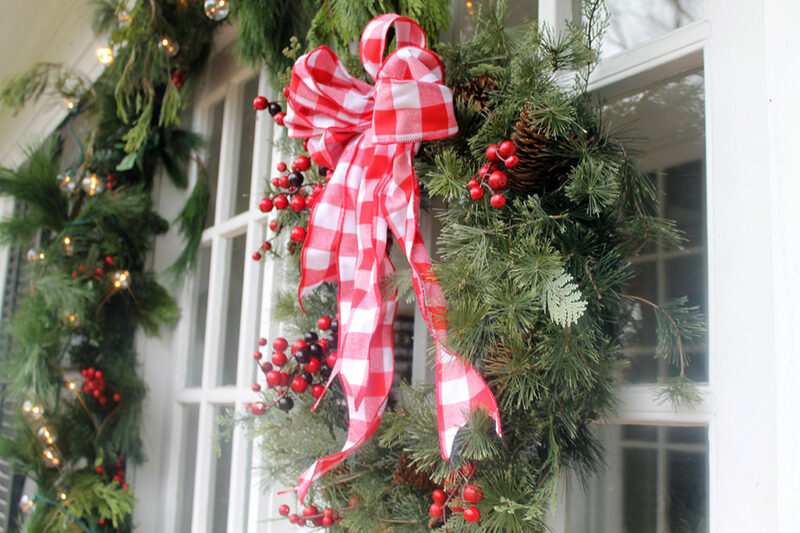 I had already decorated our front door (see last year’s decorations HERE), so I tucked the idea away to use this year. 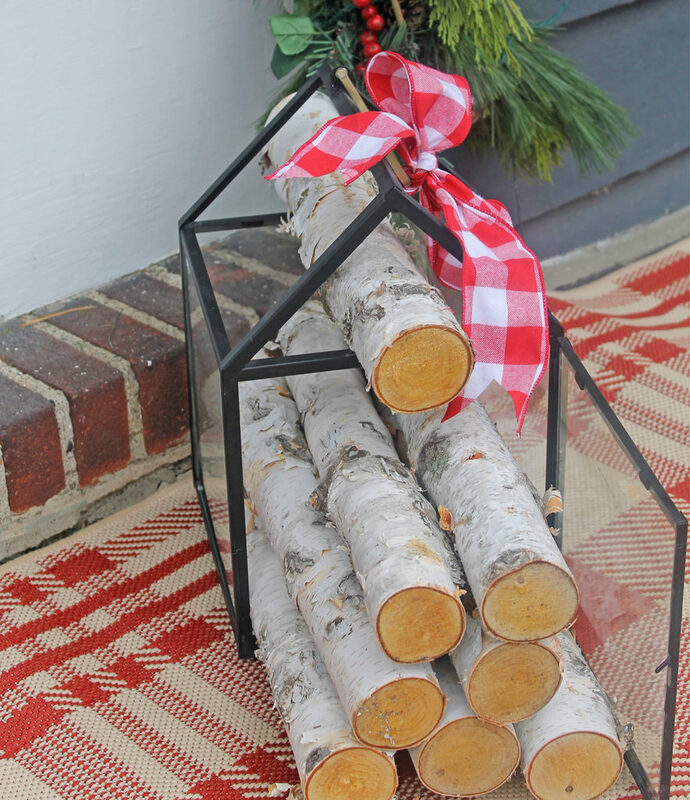 So it all started with the birch logs (found HERE)…I ordered the ones that are three feet in length. However, they sent the shorter ones by mistake. They corrected the error and sent the longer ones, and told me to keep the original shipment. Which was very nice of them! Needless to say, I had plenty of birch logs to work with. 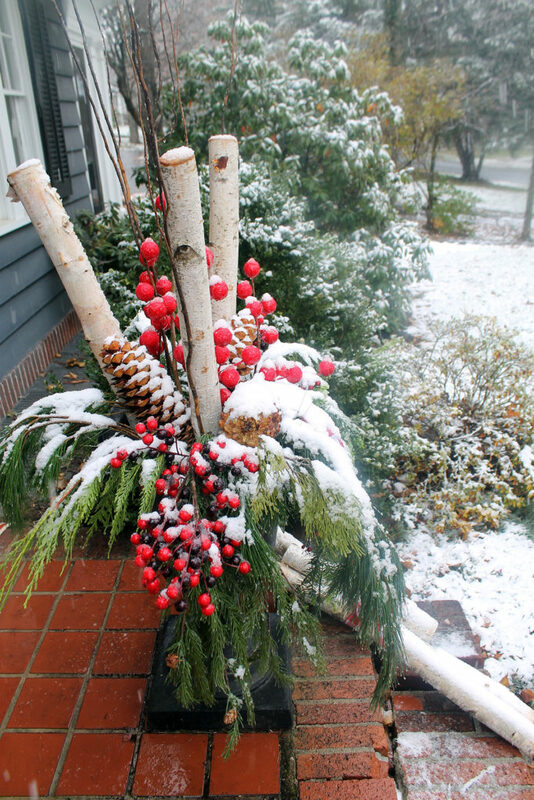 I started by placing three of the longer birch poles in each of my urns. They were “anchored” in the soil that was left in there from my summer flowers. Then I added a few other BRANCHES for height and variety. For the greenery, I used a mixture of this HANGING BUSH with cuttings from my live cedar and pine garland. I like how they hang over the edges of my urns, and the different textures make it visually appealing. 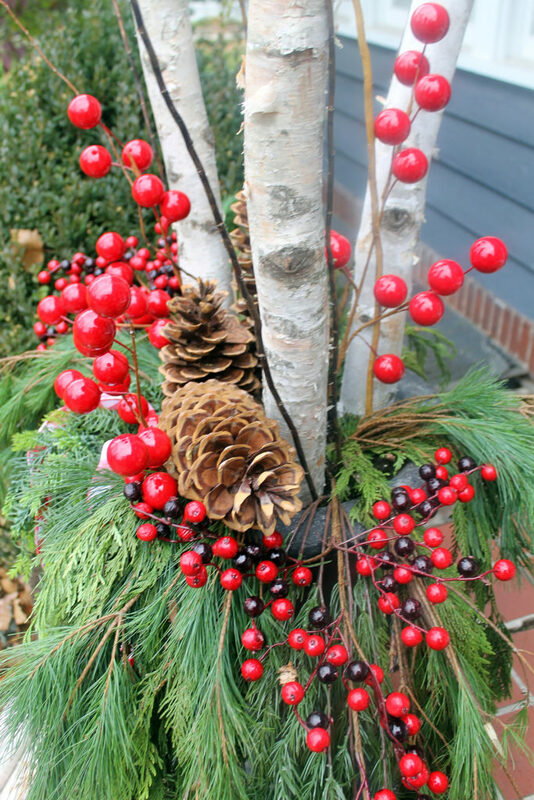 A few sprigs of BERRIES add some color…I placed one on each side of the urns by letting them hang over the greens. I mixed in some LARGER BERRIES that add another layer of height. 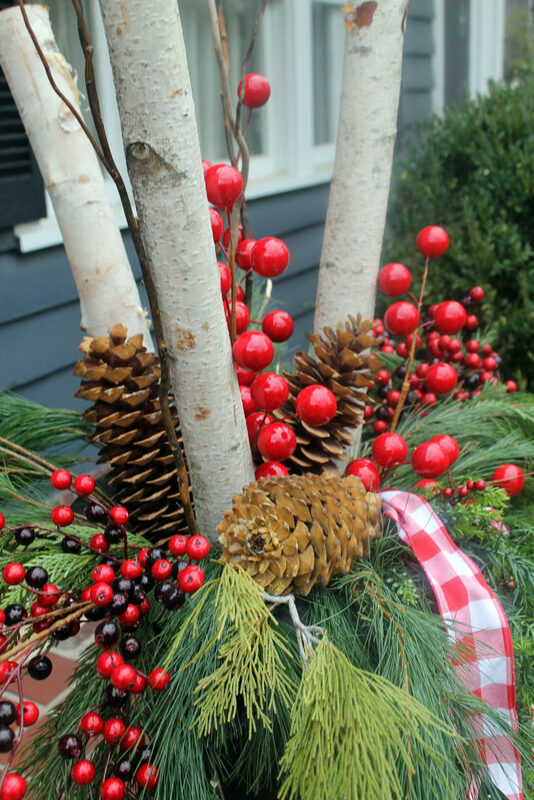 The oversized pinecones (purchased at Hobby Lobby) are placed in the middle, just in front of the birch poles. 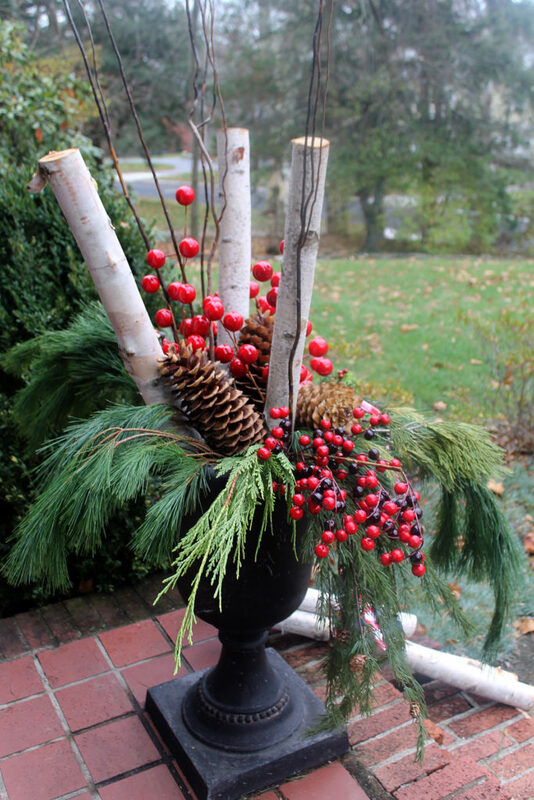 The finishing touch is the RIBBON tied around the berry sprigs and allowed to hang down the front of each urn. 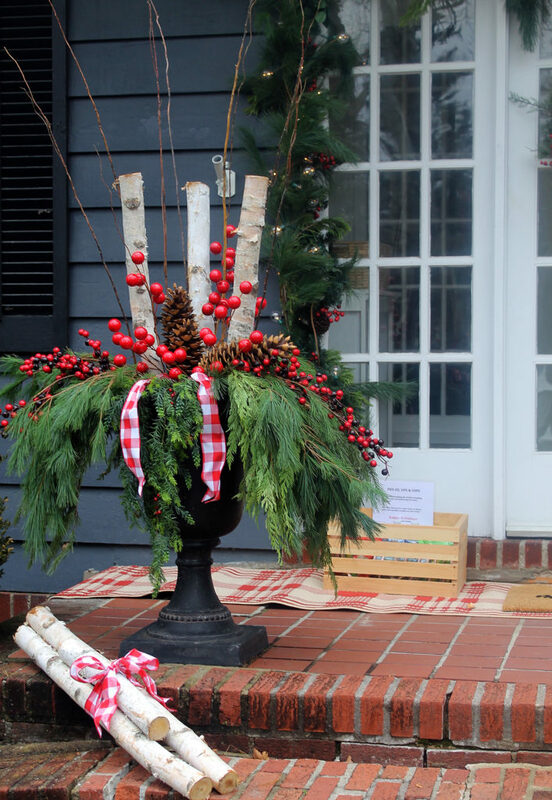 While I was working on the urn arrangements, my husband was hanging the GARLAND around the front door. 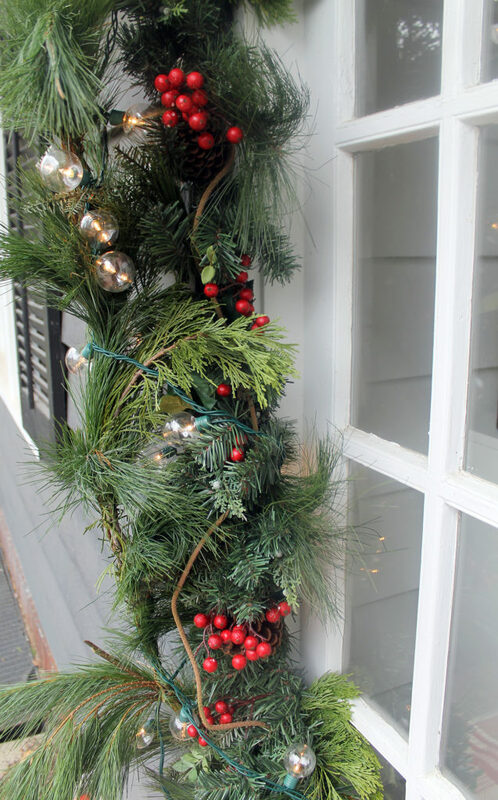 We did it a bit differently this year…we mixed the artificial garland with some live. I love how it looks, especially from the street. Our house sits up on a hill, and I’ve learned over the years that it’s better to have bigger decor (like those berries) so it can be seen. In keeping with the “bigger is better” theme, we used these LIGHTS. And it looks so pretty and festive at night! 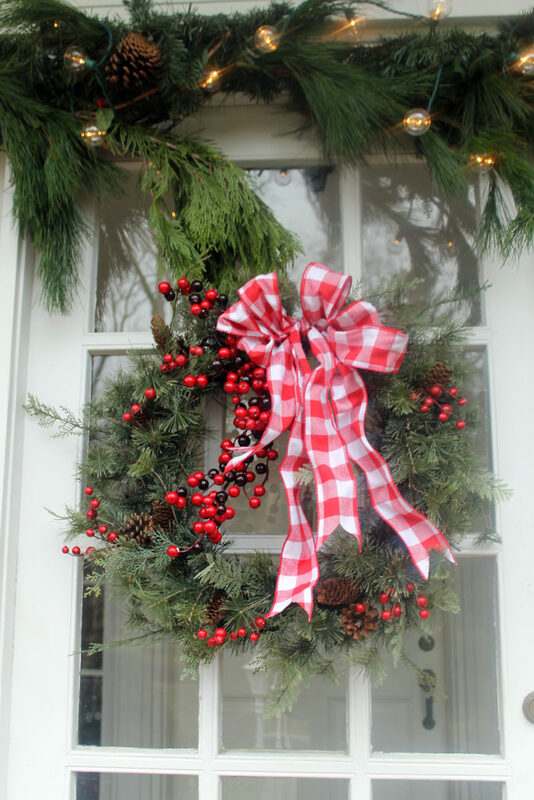 I used the same ribbon from the urns to make a bow for the WREATH on the front door. I may have added a few extra sprigs of berries for pops of color, also. You might be wondering what I did with all those extra birch logs…well, I placed them in a metal lantern (similar found HERE) that I normally keep on my LIVING ROOM SHELVES. I set the lantern closer to the door so it is somewhat protected by the overhang. 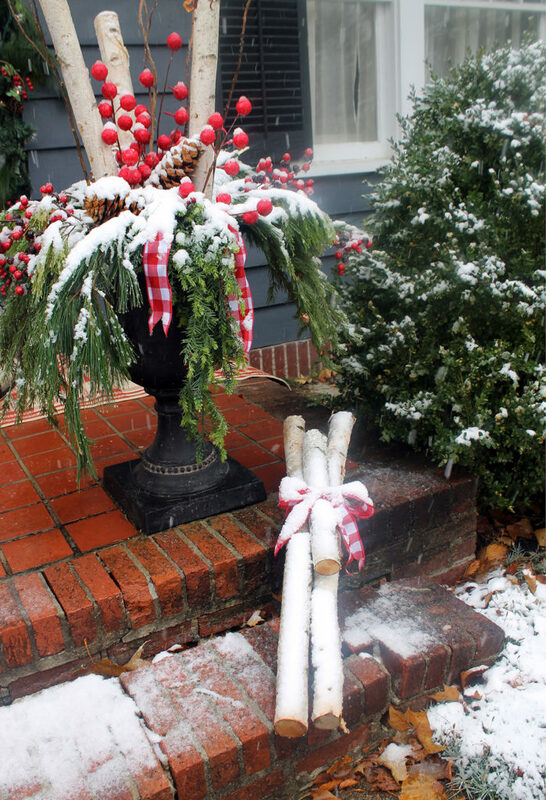 And the rest of the birch logs were tied into bundles and placed in front of the urns. 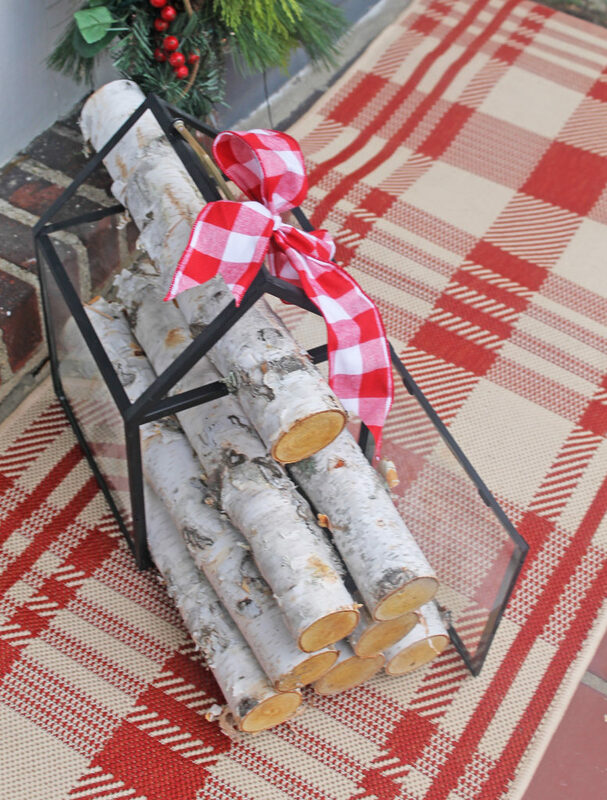 By having the birch logs in various places on my porch, it keeps the look cohesive. 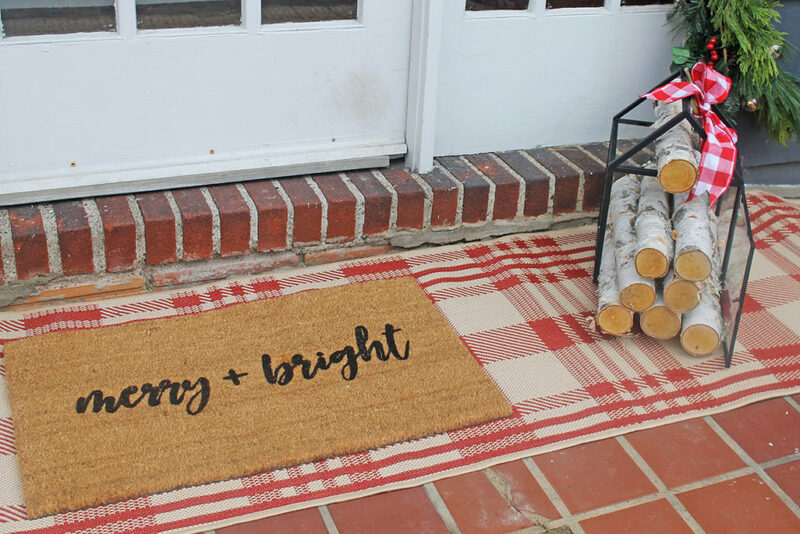 You can find the red checked rug HERE, and the merry and bright rug HERE. And what a surprise it was that it actually snowed the next day! Just a dusting, but still so pretty. So you know what I did? I headed outside with my camera to capture it before it melted. Definitely worth the cold hands to snap these pictures! 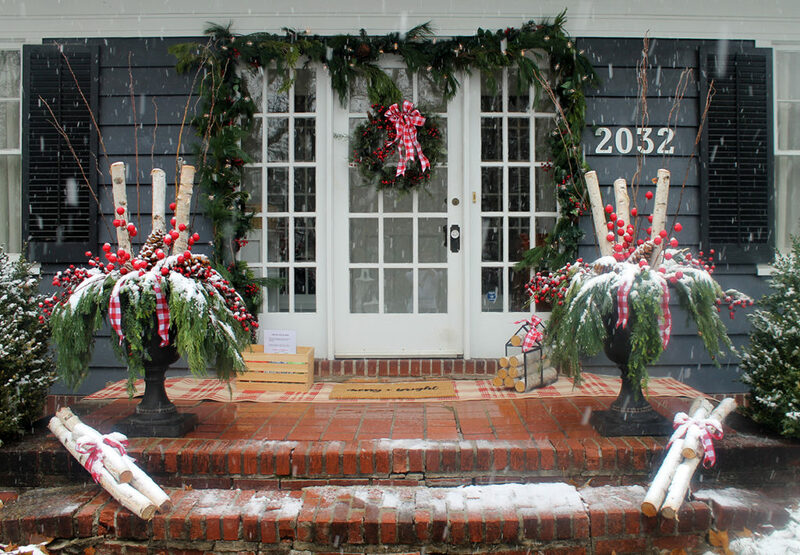 Notice the wood container to the left of the front door…did you see YESTERDAY’S POST about that? It turned out so much better than I envisioned it a year ago when I was walking around downtown Chicago.